It’s been a very long time since we’ve shared news on updates and improvements to Kanji alive with our users. Kanji alive is part-time and largely volunteer effort supported by some modest institutional funding for our software developers. As a result, it’s seldom possible for us to work as quickly and efficiently as we would like. Nonetheless, behind the scenes we’ve been making incremental improvements to our language data and adding new features to the Kanji alive web application. 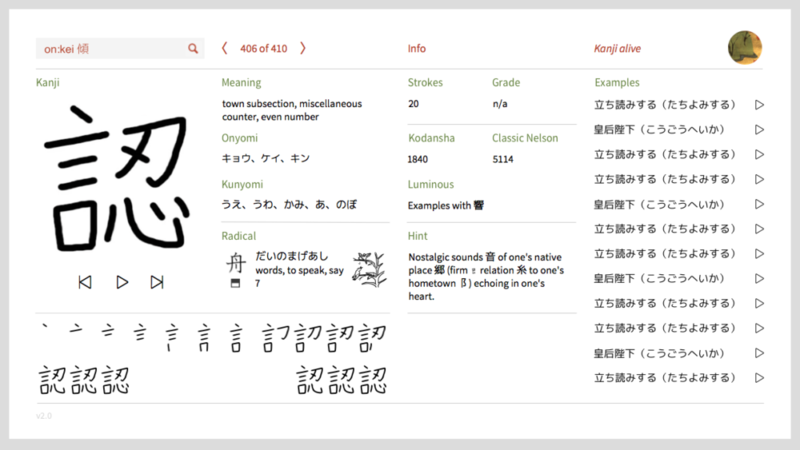 We’d like to share the details of these enhancements with you now and give you an opportunity to try out the next version of Kanji alive at http://beta.kanjialive.com. I’ll first cover what’s new in the beta version, then go over a list of known problems, and finally end with an invitation to you to help us find and fix the remaining issues in the test version so that it can be made available for general use. Full support for all radicals and their variants. Many of you will already be aware of the 214 traditional kanji radicals and their meanings page on our website. 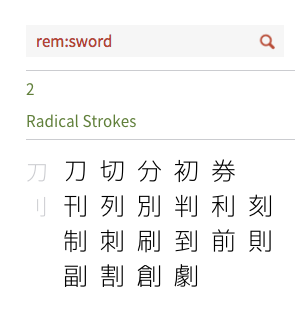 It’s a comprehensive resource of all the kanji radicals, including not just their meanings, readings and stroke numbers, but also their position in the kanji, a note on whether a radical is a variant and an indication of a radical’s importance for learners. In the past, Kanji alive didn’t include all of this data. Take the radical ⼑ (かたな) for example (“sword, knife”) which is also a kanji. As a radical, it has an important variant ⺉(りっとう) and it appears in the right-hand (つくり) position of kanji such as 則 (“rule, law”), 割 (“divide, split”), 列 (“row”) and 判 (“stamp, seal, judge”). In the current version of Kanji alive no distinction is made between these two radicals (i.e. ⼑ and its variant ⺉). Both are listed as ⼑. In the beta, you will see the correct radical variant appear alongside each kanji as well as a symbol indicating its position in the kanji. Adding support for every single radical required a significant effort — we even had to create our own custom radical font. 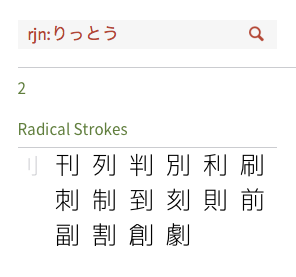 Search for kanji by the position of their radical. 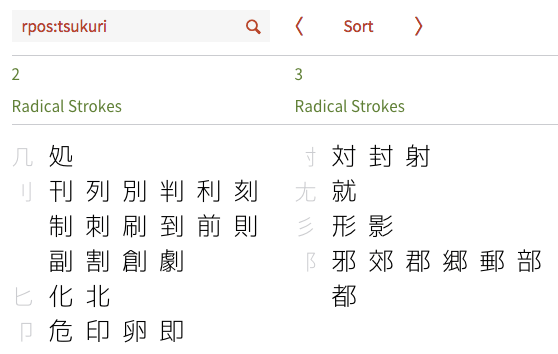 Since we had a complete list of all of the kanji radicals we decided to add a new way to search for kanji to highlight the positions a radical can take in a kanji so that learners would be able to explore and better recognize these differences. The beta offers a new advanced search key called ‘radical position’ or rpos. With it you can find all kanji whose radical is in one of the seven main positions highlighted on our 214 traditional kanji radicals and their meanings page. You can search by radical position in Japanese or romaji. For example, rpos:hen will find all kanji whose radical is on the left. You can carry out the same search by entering rpos:へん. Bookmark, hyperlink, and email your searches. In the past, if you were working with Kanji alive and wanted to share how you found a kanji or group of kanji with someone you typically needed to explain this in detail. For example, if you just wanted to quickly share with someone how to find all the kanji in Chp. 3 of Genki, you would first need to explain the syntax of the advanced search text:gen:c3. This could get a bit frustrating and cumbersome. In the beta, there is a better way. Each search in Kanji alive is now automatically represented as a custom URL or web address in your browser which can be bookmarked, hyperlinked or simply emailed to someone else. To make use of this, first search for your kanji as before, then copy the URL which appears in your browser for sharing. In the case of the previous example this would be http://beta.kanjialive.com/search/advanced?text=gen:c3. As you can see, the URL reproduces the components of the advanced search term and adds them at the end of the app’s web address. This works just as well for basic searches and even for individual kanji. Here are two more examples: http://beta.kanjialive.com/search/read (basic search for ‘read’) and http://beta.kanjialive.com/書 (kanji details for 書). New kanji typefaces. Kanji alive has always tried to encourage a holistic or comprehensive approach towards learning kanji by including all the necessary information in one place. Writing is one very important aspect of this but of course reading is equally important and learners are likely to encounter kanji in many different printed forms in the world. This is why Kanji alive has long offered a way to view not just our own hand-drawn kanji but also printed kanji in the canonical Kyokashotai (textbook), and commonly used Mincho, Gothic and Maru typefaces. In the beta, we’ve extended our support to include several important historical (Tensho, Gyosho, Kanteiryu) and one fresh (Suzumushi) contemporary style. It is important for students to appreciate that as kanji are an integral part of the Japanese culture they are still very much alive and constantly evolving. We hope that you will find the new typefaces interesting, challenging and even fun to read. Support for new textbooks. We added ‘search for kanji by textbook’ support for TOBIRA: Gateway to Advanced Japanese Learning Through Content and Multimedia, and for Vol. 1-4 of Adventures in Japanese. Please refer to the Supported Textbooks and Study Lists page for further details. Miscellaneous improvements. We’ve also made several other, more minor improvements. For example, we’ve added support for more keyboard shortcuts in the detail view, made it clearer that our dictionary references for Nelson refer to the ‘Classic’ and not the ‘New’ version, swapped Latin style parentheses for full-width and larger Japanese parentheses in the ‘Examples’ section and very carefully reviewed and revised all of our language data. As one can see, in the current beta almost nothing is aligned correctly. The initial Search & Display view has similar problems. Mobile use is still poorly supported. The beta works slightly better on mobile devices (especially large devices such as tablets) but overall, this is an area that still needs a good deal of work and attention. The user interface is not yet responsive and doesn’t adapt to different screen sizes. Online help and user guide need to be updated. The new keyboard shortcuts are listed in the online ‘Quick Reference’ guide (click on ‘Info’ in the web app) but this needs to be revised and styled properly. Misc. interactivity bugs. For example on some browsers, the main kanji animations don’t play back at the correct speed. The keyboard shortcuts don’t work properly in the search results. A small number of kanji example texts don’t fit into the space available for them in the web app. Too slow. The beta app is quite slow. On a slow (e.g. cellular 3G) connection it can take a few seconds for text, images and animations to load. Incomplete features. Although we will likely not get to them in this version, we do have a shortlist list of features and improvements we’d like to incorporate into Kanji alive in the future. 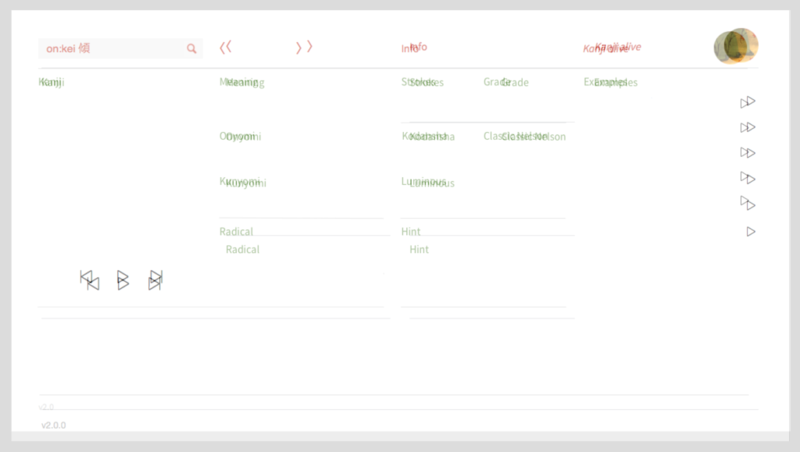 For example, the ability to print from the web app in a useful layout, in particular from the detail view. Looking further ahead, it would be very useful to be able to practice writing kanji by drawing in the app on a tablet, and to share these efforts with someone else (e.g. with one’s friends, or with an instructor) via email and/or social media. We’ve also made preparations to offer support for viewing search results sorted alphabetically by kana in Gojūon order. How can I help finish the new version of Kanji alive? First, please try out the beta at http://beta.kanjialive.com and send us your impressions either by email (kanjialive@gmail.com) or in the comments section at the end of this post. As you have seen, we’re aware of several issues already but we’re also quite sure that there are more bugs lurking in the beta we don’t know about yet. Please contribute your comments even if you suspect these might refer to already known problems. All comments are helpful! Second, please feel free to let us know what you think about Kanji alive more generally and how we can make it better. What new features would you like to see in the app? Is there something which already exists in the app but could be improved? A few years ago, we undertook a survey of our users to help us understand how you’re using Kanji alive. Perhaps the most important thing we learned is that how students prefer to study Japanese is constantly evolving. We know we can’t rely on our old assumptions so please let us know how you’d like to integrate Kanji alive into your current study habits. Finally, as some of you will be aware, some months ago we released the data and media files underlying Kanji alive as open-source. We also provided a free API to Kanji alive for developers who wanted to build their own web and mobile apps on the basis of this data. If you are a software developer and would like to volunteer some of your time to improve Kanji alive, please let us know! We may not be able to pay you but we greatly appreciate all contributions and we will always credit your work in full. In the near future, we plan to release and host the source code for the current and beta version of Kanji alive on GitHub alongside our data and media so that you can pick-out and offer patches on individual features and bugs. There are many ways to participate — we welcome your involvement! This entry was posted in News on April 5, 2016 by Arno Bosse. For what seems like a long time we’ve been meaning to make the language data and media files we created to build Kanji alive freely available for anyone to use under an open source license. Well, we finally did it! Please visit our new open source repository on GitHub where you’ll find all of the language data used in Kanji alive in Excel and CSV spreadsheet formats, our custom Japanese Radicals font as well as all of our kanji animations, audio examples and image files. Everything (with just a handful of exceptions due to copyright restrictions) is freely available under a generous Creative Commons Attribution 4.0 International (CC-BY) license. What does this mean in practice? Well, if you are a student, this means that you can copy all or part of our files and data onto your laptop or tablet to help you study Japanese even if you’re not connected to the internet, or perhaps re-use some of it to create your own Anki flash cards. If you are an instructor, it means, for example, that you can re-use our kanji animations or audio on your class website or on your institution’s course management system. And if you are a developer, it means that you are allowed to use this material to build (and even sell) your own kanji mobile app. Update: Developers, please take a look also at our public API on Mashape. However, please note that under the terms of the Creative Commons CC-BY license, you must always give appropriate, public credit to Kanji alive, provide a public description of the changes (if any) you’ve made to our material and offer a clear link back to our website (https://kanjialive.com). Lastly, you may not call your own work “Kanji alive” or re-use the Kanji alive logo. Please see our Credits page for additional details or contact us if you have any questions. We’re very happy to be able to share all these items with you – they were the product of a great deal of hard work over many years by a group of dedicated and talented individuals. Now we’re eager to find out what new & creative uses you’ll find for this material. Please let us know! This entry was posted in News on July 18, 2015 by Arno Bosse. We occasionally receive requests from our users asking us which kanji are supported by Kanji alive. A short and simple answer is that Kanji alive supports the 1235 kanji which are taught in Japanese elementary schools and are included in the kanji lists of the Japanese Language Proficiency Test (JLPT) up to N2. If you want to learn more about the reasoning behind this decision please refer to our User Guide. However, explaining which kanji we support is not the same as showing them. If you prefer to find these kanji on an actual list by using your browser’s search function, you may use the listing provided below. This shows all 1235 kanji supported by Kanji alive, sorted by their kanji stroke number. 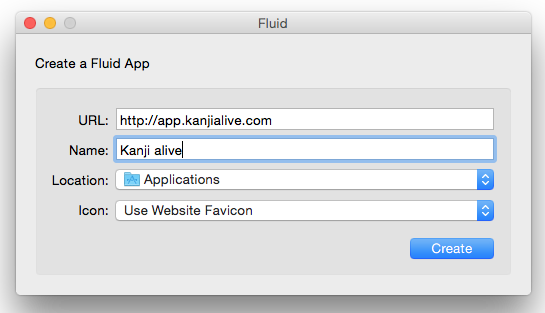 Alternatively, it’s also possible to use the Kanji alive web app (http:/app.kanjialive.com) to search for supported kanji by entering just the kanji itself into the search field. The web app also supports many other search methods. We hope this list will be a useful resource! As always, please don’t hesitate to get in touch with us if you have further questions about Kanji alive. This entry was posted in News on March 2, 2014 by Arno Bosse. Last month we ran a survey on our website to learn more about our users and gather your views on how to improve Kanji alive. We ran the survey for three weeks until we collected 100 anonymous responses. Below are the full responses to each question. We’ll follow-up with a summary and discussion in a future post. This entry was posted in News on February 4, 2013 by Arno Bosse.